Mr FRED J MARTINS: the only son of late MICHEAL . H.
Mr. Fred Martins says: "i want you to decease from this so called ABBA ABACHA"
Hello, I am Miss Young. This story is about a man that sends me a picture of Mohammed Abacha instead of his own, and this makes him claim that he is a cousin of Mohammed. Later I find out that he also is involved in other kinds of fraud. Go to the homepage to see more stories. Mohammed Abacha is a son of the former president of Nigeria. His mother, Maryam Abacha, is a well-known figure on the Internet. See my story about her here. I am Mr FRED J MARTINS the only son of late MICHEAL . H. MARTINS the managing Director of DUBE petroleum company in LAGOS I must confess my agitation is real, and my word is my bond, in this proposal. 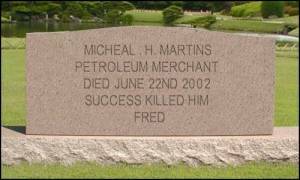 My late father was a petroleum merchant and because of his success in this field also because of his wealth, his business associates in the field was very envy and family friends also were against him. After death of my mother when she was giving birth in 1984,at that time i was six years old (6yrs), because my father had a great love for me as his only son and I won his confidence because he knows that a day will come when I will have to manage his vast wealth but the relationship painfully did not last. This is a story that seems fictitious to me but today I am facing the reality of being an orphan who is also being hunted by men of wicked motives since tragedy does not alter fact but fact remains when other hopes have being shattered. 3) Bank address, telephone and fax number For you to assist me transfer this money in your private bank account, the said amount is (fifteen Million Dollars) $15 Million. I am compensating you with 20 % of the total money amount, now all my hope is banked on you and I really wants to invest this money in your country, were there is stability of Government, political and economic welfare. Honestly, I want you to believe that this transaction is real and never a joke. My late father Chief MARTINS gave me the copies of the certificate of deposit issued to him (BY THE COMPANY) on the date of deposit. I believe that you are able to keep this transaction secret for me because this money is the hope of my life, it is important. Please reply me immediately after you must have gone through my message fill free and make it urgent. N.B Try and negotiate for me some profitable blue chip investment opportunities which is risk free which I can invest with this money when it is transferred to your account, personally I am interested in estate management and hotel business, please advise me. Reply me back immediately you receive this message for more explanation. And promise me to be a father considering my situation and not to betray me and also accept me to belong to your family once again I want to have a family. NB: my late father used me the only son as the beneficiary / next of kin on the day of deposit and also told me to look for a foreign assistant or a foreigner with a legitimate bank Account abroad who will stand as co-beneficiary and partner abroad. Freds letter is identical to the letter from William Koffi on www.waronspam.com and from Davis Kahlif on www.spikynorman.dsl.pipex.com. I reply Fred that I am interested in helping him. I am very happy reading your mail. I want to let you know that if you can truely assist me in getting this money i will never forget you in my life and i guess this is the beginning of a life time friendship. I happy to hear that you travel alot and i guess it will make things easier for us if you can travel to spain so you can get the money in cash instead of the trasfer. Please call me on my tel no 234-802-322-5359 so i can explain to you better. Please, this have to be a confidential matter. I await your phone call. ... The next couple of days I'll be going to Aberdeen for the funeral of an old friend of mine, Scott McKinney, that just died of a heart failure. He was only 46! I will also visit his family. 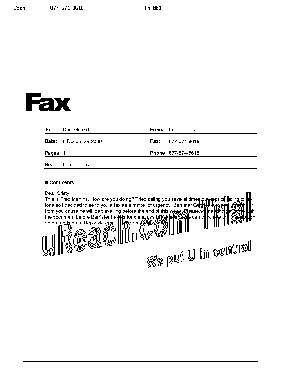 Please try to email or fax the documents that I have to sign. Thanks for your email, I am very sorry about the death of your friend, please accept my sympathy. You are such a beautiful lady, your picture is really nice, i will send you mine as soon as i get it scanned. I have notified OVERSEA CREDIT COMMISSION that i have found a foreign partner that is ready to do business with me, the money is with this security company in Spain but all the administrative works will be done in their London office before RELEASE ORDER instruction will be given to their Volt office in Maldrid Spain to release the money to you. I want you to fax the following details to Oversea Credit Commission's London office so they can file in for the relase of the funds into your bank account incase you can not travel to Spain. 2. contact address, telephone and fax nos. 3. Bank account details incase you cannot travel to collect the money in cash. You are to fax or email these informations to the security company as soon as possible so they can commence with the release of the funds. I would like to know how soon you can travel to Spain for the purpose of claiming this money. Thanks for your assistance. ... You also ask when I can come to Madrid. Well, that depends on when I get my VISA for Sct.Petersburg. I will let you know as soon as I get it. If possible, I would like to combine the two cities. It is a long and tiring trip to go to Europe. How are you doing and how was the funeral? Hope it wasn't too stressful to you? Got your mail and i have attached a picture of mine to this mail.What nationality are you? if you are using an American passport, you wont need a visa to travel to Spain cos you won't be staying for more than three days. But incase you still require a visa, How soon do you think you can get your visa? Please let me know because OVERSEA CREDIT COMMISSION want to know how soon you are coming. 2.contact address, telephone and fax nos. 3.when you will be in Maldrid to pick up the money? Please get back to me as soon as you have sent the fax. Call me on my tel no: 234-802 322 5359 so we can discuss. I await your phone call. Thanks for your assistance and take care my dear. I am quite sure that the picture Fred sent, is a picture of Mohammed Abacha. Note the new email address for Henry Smith. Maybe the old one has been closed? Call me after you have read this mail. Thanks for your asistance and reply as soon as possible. I got your picture and I must say that I was surprised. You look very much like Mohammed Abacha that I once met at a party in New York. Are you close family?? I have emailed Henry Smith at henrysmith@financier.com, but there has not been any reply. Should I send him a letter instead? How you doing? i hope you are cool? Are you serious you've met Mohammed Abacha before? We are distance cousins but after the death of my father and his father both families lost contacts but he's somewhere up northern Nigeria. I can see you are a very busy and hard working lady. what do you do for aliving. I made a mistake in the email address it is not henrysmith@financier.com but overseacrdtcom@consultant.com so please correct it and send them a fax immediately instead of an email. Please, try and send the fax today so you could finalise with so that you could stop over at Maldrid Spain when in Europe to collect the money, this is the more reason why i want you to fax them instead of email or letter so you could finalise with them so all that will be left is to pick up the money from their VOLT OFFICE in Maldrid Spain. Please, respond as soon as possible. Hope you are enjoying your trip? I want you to mail me a telephone no i can reach you at now. Respond asap. I am mr Fred Martins foreign partner. I plan to go to Madrid next week to pick up the consignment. Will that be ok? Is there anything else that you need to know about me, or that I should bring? Sorry for the late answer, but I have just been through the worst week-end in my life. As you know, I was going to Sct. Petersburg, and everything went according to plan until I landed there. I had been chatting with a nice fellow on the plane, and had promised to carry one of his bags through the customs because he was handicappet and we were going to the same hotel. That was a BIG mistake, because I was stopped in the customs, and it turned out that his bag contained drugs. And the man, whose name I didn't have, was nowhere to find. To make a long story short, I was arrested, and was first released when I managed to get in touch with the American Embassy this morning. It was a surprise for me to hear that you are a cousin of Mohammed Abacha. In fact, I am in contact with your cousin Abba Abacha, that has promised me more that the double of what you are offering me, for helping him to transfer some money. His email address is bar_abb10@myway.com, so now you can have a family reunion. Please send him my regards. I have contacted Mr Henry Smith at Oversea ..., and I will keep you informed. I am really sorry about your ordeal at Petersburg, Please if you don't know someone that well don't help anybody in carying any sort of bag again. I don't have any cousin by the name ABBA ABACHA, that is not my cousin that you are deling with, i am very sure he is impesinating so please, i want you to decease from this so called ABBA ABACHA. I hope you have not told him or any other person about our deal? Sorry once again for your ordeal. Please, endeavour to forward all correspondant mails from oversea credit commission so i could advice on what next to do. Take care of yourself and stay out of trouble. NB: Forward a telephone no i can reach you at presently. THIS IS TO ACKNOWLEDGE THE RECEIPT OF YOUR MAIL. SEQUELTOYOURRESPONSE, YOU ARE TO PROVIDE THE FOLLOWING DOCUMENTS BELOW VIA FAX OR EMAIL AS SOON AS POSSIBLE. THESE ARE THE ONLY TWO DOCUMENTS THAT CAN CONFIRM YOU AS THE BONAFIDE FOREIGN PARTNER OF MR. FRED MARTINS AS INSTRUCTED BY HIS LATE FATHER. 2. CHANGE OF BENEFICIARY FROM THE FEDERAL HIGH COURT OF NIGERIA. AFTER WE HAVE RECEIVED COPIES OF THESE DOCUMENTS BEFORE WE CAN GIVE ORDER RELEASE INSTRUCTION TO OUR VOLT OFFICE IN MALDRID SPAIN WHERE THE MONEY WILL BE REMMITTED TO YOUR BANK ACCOUNT. THE DESK OF HENRY SMITH. The following day I forward the email from Henry to Fred, and ask him what to do. You must be very polite and humble because he is a very influencial Barrister and also SAN (Senior Advocate of Nigeria) here in Nigeria. Please, endeavour to mail me as soon as you finish mailing Barrister Gabriel Falana. Thanks for your assistance. I WILL ADVISE YOU SEND COPIES OF THE REQUIRED DOCUMENTS AS SOON AS POSSIBLE IF YOU INTEND PICKING UP YOUR MONEY BY NEXT WEEK. I received your mail, but I must admit that my schedule this week is very tight. It would be nice if you would help me to write the letter to the attorney (and you know how to write it polite and humble!). I also think I need you to send me the Certificate of Deposit and the attorneys address. SEQUEL TO YOUR REQUEST, I HAVE RECEIVED YOUR PERSONAL DETAILS. I WAS AT THE FEDERAL HIGH COURT YESTERDAY TO CONFIRM THE AMOUNT IT WILL COST TO PREPARE A CHANGE OF BENEFICIARY. IT WILL COST THE SUM OF $2,830.00 (TWO THOUSAND EIGHT HUNDRED AND THIRTY UNITED STATES DOLLARS). ENDEAVOUR TO MAIL ME THE WESTERN UNION MONEY TRANSFER TEST QUESTION AND ANSWER AND ALSO THE MTCN. AS SOONAS I RECEIVE THE FEE, I WILL PROCEED WITH THE PREPARATION OF THE CHANGE OF BENEFICIARY WHICH WILL BE READY THE SAME DAY I RECEIVE THE MONEY. ANY THE DELAY OF THE PAYMENT ABOVE WILL LEAD TO DELAYS OF MY SERVICES TO YOU. ALWAYS AT YOUR SERVICE. YOU CAN CALL ME ON 234-1-7757923 AT ANYTIME. The problem i have right now is that i don't have any money presently, This is because i just paid for my younger brother's hospital bill. Please, what can you do about this? Can you send the money today so we can get the change of beneficiary as soon as possible for you to be able to claim the money next week. Remember that i have set aside 10% of the money depositted at OVERSEA CREDIT COMMISSION for expenses incured during this transaction, so have it in mind that your money shall be given back to you at the end of this deal. I will send you the CERTIFICATE OF DEPOSIT as soon as we conclude with the barrister. I await your soonest response. As expected, a fee came up to be payed immediately. How are you doing today? I want you to confirm to me if you received the attorney's response that i sent you? Please, respond ASAP. How are you? I am ok, but I have problems with handling my email. They seem to come in at a greater volume than I can handle. Hopefulley this is only temporary !! Yes, I received the attorneys answer. Thank you for helping. I understand that we have to pay $2830 up front. Although I find it an unresonable high sum, I will try to get it together. However, there is one thing that we have in place first. My finansial advisor, Louis, insists on some proof of our deal. He still thinks that your picture looks like a picture of Mohammed taken from a magazine. Will you send me the Certificate og Deposit, that you have? Also, if you could send an uptodate picture of you holding a sign with your name, that would really get Louis back on our side. Just received your mail,How you doing? I'm loosing trust in you because i can remember very well that i told you my late dad had too many business associate both home and abroad that are ready to kill me because of my inherritance and you promised not to tell anybody about this deal now you have told about how many people? I don't know. I feel very uncomfortable with this. This was suppose to be very confidential. I have the certificate of deposit with me but i cannot send it to you untill am sure you are ready to assist me by responding to the attorney's demand so that you can pick up the money this week. How much is $2,830 compared to what you are going to get when you have collected the money? If i had the attorney's fee i would have given it to him and you won't have heard about it but my present financial state is running at a defeceit that was why i requested your induldged assistance. Please, assist me if you can. you have to understand my situation. I am sitting in another part of the world. I would really like to help you and believe your story, but you have not been very cooperative so far. The certificate of deposit that you claim to have, you wont send to me, although that migth be the proof I need in order to finish our business. To be honest, I dont believe that you have the certificate. However, if you present it to me, we will be back in business again. Please dont worry about the confidentiality of our business. I have only talked about it with Louis. He is my financial advisor, and I dont make any business without him. I trust him 100 %. WE HAVE NOT YET RECEIVED COPIES OF YOUR REQUIRED DOCUMENTS FOR THE CLAIMS OF THE MONEY DEPOSITTED IN OUR OFFICE. WHEN DO YOU INTEND TO PICK UP YOUR MONEY? I have run into a problem. My partner, Fred, says he cant give me the certificate of deposit, probably because it has vanished. Please inform me on how we can proceed in this matter without the certificate of deposit. How are you today? Attached to this mail is a scanned copy of the CERTIFICATE of DEPOSIT. I hope that you will be able to send the attorney's fee today so that we can conclude with the attorney in the preparation of the CHANGE OF BENEFICIARY today so that i can post the two documents to you tomorrow. Remember that you will have to travel to Spain with the documents in hard copies. I await yourimmediate response. How are you today? I want you to confirm if you received a scanned copy of the CERTIFICATE OF DEPOSIT that i emailed to you yesterday? When are you going to send the attorney's fee so that he can arrange for the CHANGE OF BENEFICIARY? I await your immediate response. I have been in contact with my bank, in order to raise the money for the fee. They tell me that I should be very careful in making business with Nigeria. They have seen several fake documents and pictures, and that makes me a little worried. Will you help me get 100 % sure about your identy, and send me a recent picture where you hold a sign with your name on it?? Just received your mail, I don't see any reason why we should deal again because there is no trust and i can't deal with some that doesn't trust me or that i don't trust. More also i don't feel safe dealing with you anymore because i don't know the amount of people you have discussed this deal with. I will seek for a new foreign partner that could trust and assist me so that we can collect the money and i am willing to give the person 20% of the money. THE MONEY WILL NOT BE RELEASED TO ANY OTHER PERSON APART FROM HIM IF YOU CANNOT PROVIDE COPIES OF THE DOCUMENTS. IF YOU ARE TRUELY HIS FOREIGN PARTNER YOU SHOULD HAVE COPIES OF THESE DOCUMENTS. THIS IS TO INFORM YOU THAT YOU CAN COME CLAIM THE MONEY BUT SINCE THERE'S NO EVIDENCE OF CERTIFICATE OF DEPOSIT AND CHANGE OF BENEFICIARY, YOU WILL HAVE TO PAY A FEE OF �3,200.00 AS SOON AS WE RECEIVE THE FEE YOU WILL BE GIVEN A DATE FOR THE COLLECTION OF THE MONEY. WE AWAIT YOUR IMMEDIATE RESPONSE. I planned to go to Madrid this morning, for some business, and was hoping to visit your office in Madrid as well. Unfortunately I did not succeed. I was picked up by the dutch police in Shiphol airport and taken for questioning. To make a long story short, the Spanish authorities will not allow me to enter Spain because I was arrested in Sct.Petersburg airport some weeks ago. I suppose it is all this anti-terror stuff, that makes them stop even young girls like me. I would still like to claim the money, but since I cannot collect it in Spain, could you transport it to London (or Amsterdam)? If you bring it to London, I suggest that I come and collect it sometime within the next 2 weeks. Can that be arranged? I will bring the �3200 you request, and pay for the extra transport to London. ENDEAVOUR TO EMAIL US THE WESTERN UNION MONEY TRANSFER TEST QUESTION AND ANSWER, ALSO THE MONEY TRANSFER CONTROL NUMBER TO ENABLE THE REMMITANCE DIRECTOR CLAIM THE MONEY. WE AWAIT YOUR IMMEDIATE RESPONSE. THISI IS TO INFORM YOU THAT YOUR MONEY HAS JUST ARRIVED LONDON TODAY AT ABOUT 4:30PM BUT YOU ARE YET TO PAY 3,200 POUNDS. WE WOULD LIKE TO KNOW WHAT IS CAUSING THE DELAYS AND WHEN YOU WOULD BE AVAILABLE IN LONDON TO PICK UP YOUR MONEY. WE AWAIT YOUR IMMEDIATE RESPONSE. PLEASE, NOTE THE CHANGE IN THE NAME IN WHICH YOU ARE TO SEND THE MONEY. I have been very busy, so I have asked Louis to handle some of the practical issues. He went to the Western Union office this morning and sent the money to Mr Bamidele Osagie. The MTCN is 26169910407. Tomorrow I will try to arrange a trip to London. I assume that we will meet in your office in Boston Road. I will inform you about the fligthschedule when I have booked. ENDEAVOUR TO EMAIL US THE WESTERN UNION MONEY TRANSFER TEST QUESTION AND ANSWER, AND ALSO THE MTCN SO THAT THE PERSONAL ASSISTANCE CAN CLAIM THE MONEY AT THE WESTERN UNION AGENT NEAREST TO OUR OFFICE. PLEASE DO THIS AS SOON AS POSSIBLE SO THAT ALL THE ADMINISTRATIVE WORKS COULD HAVE BEEN DONE BEFORE YOUR ARRIVAL TO LONDON TO PICK UP YOUR MONEY. WE ARE VERY SORRY FOR ANY INCONVENIENCE THIS MUST HAVE CAUSED YOU. PLEASE, BEAR WITH US. PLEASE, RECTIFY THIS MISTAKE SO THAT WE CAN RECEIVE THE MONEY TODAY AND COMMENCE WITH THE ADMINISTRATIVE WORKS IMMEDIATELY BEFORE YOUR ARRIVAL TO LONDON FOR THE PICK UP OF YOUR MONEY . ENDEAVOUR TO MAIL US THE WESTERN UNION MONEY TRANSFER TEST QUESTION AND ANSWER AND ALSO THE MTCN. YOU ARE TO BOOK YOUR FLIGHT FOR NEXT WEEK SO THAT WE WOULD HAVE TAKEN CARE OF ALL THE ADMINISTARTIVE WORKS BEFORE YOUR ARRIVAL TO LONDON THIS IS TO AVOID YOU BEING DELAYED IN CLAIMING YOUR MONEY WHEN YOU ARRIVE LONDON. ALSO EMAIL US YOUR FLIGHT DETAILS SO THAT WE CAN COME PICK YOU UP FROM HEATHROW AIRPORT. I dont like the tone in your mail. Dont blame me for your errors. How was I to know that you sent your director on leave? Call him back from leave if that is the problem! How many personal assistents does he have? You have given me 2 different names! Which one is the correct, or is there another assistant? I have a problem in paying �3200 once more. I cant raise that much with a short notice. I contacted WU, but they could not pay the first �3200 back. I dont know what to do now. What do you suggest? WE ARE VERY SORRY FOR THE MIX UP. THE REMMITANCE DIRECTOR IS OUT OF UNITED KINGDOM AND HE HAS ONLY ONE PERSONAL ASSISTANCE THAT COULD CARRY ON THE TRANSACTIONS ON HIS DESK, THE TWO NAMES THAT WERE EMAILED TO YOU IS THE SAME PERSON JUST THAT THE FIRST ONE WAS A SHORT FORM OF HER NAME WHILE THIS IS THE FULL NAME AS IT IS ON HER PASSPORT. THIS IS A VERY LITTLE ISSUE , I WANT LOIUS TO CALL WESTERN UNION OFFICE WHERE THE MONEY WAS SENT FROM AND TELL THEM TO CHANGE THE RECEIVER'S NAME TO THE NAME BELOW AND THAT'S ALL YOU HAVE TO DO, YOU DON'T HAVE TO PAY ANY MONEY TO DO THIS. ENDEAVOUR TO EMAIL US THE WESTERN UNION MONEY TRANSFER TEST QUESTION AND ANSWER AND ALSO THE MTCN AS WE LOOK FORWARD TO MEETING YOU SOONEST, PLEASE ACCEPT OUR APPOLOGY. I am also sorry for your mixup of names. I had Louis call WU again, and I think you have a serious problem. WU told him that the �3200 had been collected yesterday. Are you trying to make a fool of me? - or has your director stolen the money? Anyway, now it is time for you to keep your part of our deal. I am coming to London to collect the money. Please tell me how soon you can arrange a meeting, so that I can book a plane. Now that we are going to meet, I have attached my picture. Will you send me yours, so I know how my business partner look? FIRST AND FOREMOST, THE REMITANCE DIRECTOR HAS BEEN OUT OF UNITED KINGDOM FOR ABOUT 2WEEKS NOW SO I DON'T SEE HIM CLAIMING THE MONEY BECAUSE HE HAS NOT BEEN AROUND AND HE HAS NO ACCESS TO THIS EMAIL BOX. IF YOU ARE SERIOUS ABOUT CLAIMING YOUR MONEY, MAKE SURE YOU SEND THE 3,200 POUNDS TODAY PRIOR TO YOUR ARRIVAL TO LONDON OR ELSE YOU WOULD BE ASKED TO PROVIDE THE CERTIFICATE OF DEPOSIT AND CHANGE OF BENEFICIARY BEFORE YOUR MONEY ($15 MILLION) WILL BE GIVEN TO YOU. I THOUGHT I WAS TRYING TO HELP YOU BUT NOW I FEEL YOU ARE TAKING ME FOR A FOOL BECAUSE NO ONE IN THIS OFFICE CLAIMED THE MONEY YOU CLAIMED YOU SENT, IN SHORT I DON'T BELIEVE YOU SENT ANY MONEY. I WOULD ADVISE YOU SEND THE MONEY TODAY BY YOURSELF IN THE NAME OF THE REMITANCE PERSONAL ASSISTANCE (OLADAPO SAMAIYE) AS SOON AS POSSIBLE THEN I'LL BE ABLE TO GIVE YOU A DATE TO BOOK YOUR FLIGHT TICKET. I AWAIT YOUR IMMEDIATE RESPONSE. I WOULD LIKE TO KNOW IF YOU ARE STILL INTERESTED IN CLAIMING YOUR MONEY? IF YOU ARE, COME ALONG WITH THE CERTIFICATE OF DEPOSIT AND CHANGE OF BANAFICIARY OR YOU PAY THE SUM OF 3,200 POUNDS. I AWAIT YOUR IMMEDIATE RESPONSE. After 8 weeks correspondence, I decide to stop. But now Fred surfaces again, after dropping me 1 month ago. I note that Fred and Henry send from the same IP-address, so I am talking to a scammer with (at least) 2 identities. I have been denied access from my other mail box so from now on you should disregard the mails from my other mail box. You think you are too smart? You went behind me to try get my money from OVERSEA CREDIT COMM. and you thought it was going to work out with the documents? If you can send part of the money let the barrister commence with the preparation of the CHANGE OF BENEFICIARY since i have in my possession the CERTIFICATE OF DEPOSIT so that i can post both documents to you in hard copies. Reply ASAP. Nice to hear from you again. I hope they havent closed down your new mailbox yet. Sorry about my affair with Oversea. It costed me �3200, so I am rather low on cash right now. If we continue our business, how much should I send to the Barrister? I would like to know how soon you can come up with the advance fee so that you send the money to his cashier for him to commence the preparation and he said that it will take two working days. I await your immediate response. Mr Fred Martins has informed me that you are willing to prepare the CHANGE OF BENEFICIARY if I send you an advance payment. As I am on a business travel to Lome at the moment, my access to cash is rather limited. When I return to the states, I can pay you the rest. Will it be alright to send you $900 now, in order to get the CHANGE OF BENEFICIARY put together? Thank you for talking to the barrister and explaining him the situation. My business here is now finished, and I am returning back home. When I get back, I will contact my bank. As you know, I can only come up with $900 at the moment, and that is not enough. How are you today? I would want us to conclude this transaction before christmas. I await your immediate response. I just returned home from my trip to Africa. It was a long and tiring trip, so I hope for a good nights sleep. I can understand that you want to finish this business before cristmas. I would like that too. I will return to you when I have talked with my bank and accountant, and have an overview of the situation after this hectic business trip. How are you doing? I spoke with Barrister Gabriel Falana and he told that he will be going for a christmas break with his family to America soon. Please, try and send him the advance payment so he can commence with the preparation of the CHANGE OF BENEFICIARY for him to be able to conclude with us before he travels. I hope the business trip you went for was successful? Do you mind if i ask what business you are involved in Africa? My dear, i don't want you to stress yourself so mail me back after your sleep. Take care. This has lasted long enough. I search for his IP-address on the Internet, and find other scam-letters sent from his IP-address, as well as other types of fraud. The latest was only 2 days old. Let us try to scare him off with FBI. I was contacted by FBI early this morning. They were investigating some kind of international fraud. I dont think they suspect me for anything, at least that is what they told me. They asked me about the names Soga Jones, George Egwu, Samson James, Opeyemi Oladepo Samson, Andrew Adams and the telephone numbers 234-8037161983, 234-17757106 and 234-8037161983. I told them that I didnt know any of these. The telephonenumbers are Nigerian, so maybe you recognize some of the names or numbers? This worries me, and I think we should be very careful in our business. I dont want FBI to interfere. I have never come accros any of those names nor the telephone nos. I will never do anything that will lead the both of us into trouble, alright? Have you gotten intouch with Barrister Gabriel Falana? Please, do so if you haven't so that we can conclude this transaction before christmas. I want you to email me your personal mobile telephone no so i can call you. I await your response. THIS IS A REMINDER TO YOU THAT I WILL BE GOING ON CHRISTMAS BREAK SOONEST, SO ACT URGENTLY. 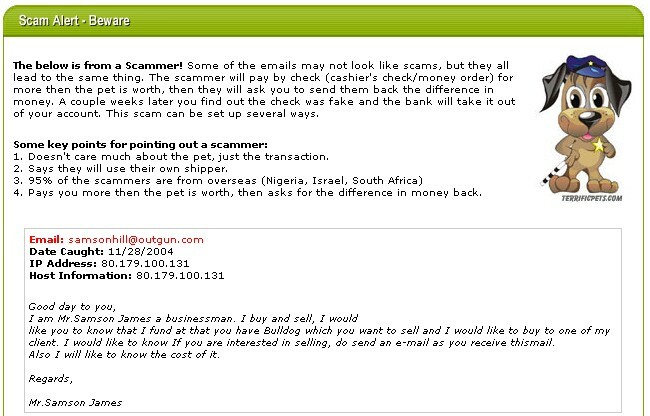 As expected, the e-mail from Falana was sent from the same IP-address that Fred (and the Oversea Credit Commision) uses. How are you doing? hope your fine, have not hard from you,just want to know what maybe the matter,hope to hear from you soon,thank you. It pleases me to hear that you are not connected to any of those criminals. I forwarded that information to FBI when they called me again this morning. I think they are tapping my emailaccount, because they knew what emails I have received lately. They also told me that the email from Falana was sent from your PC. What is the reason for that? When is Falana going on holiday? How are you today? How come FBI keep on stressing you? What do you have with them? I hope you have not gotten yourself into trouble? My previous mail was sent from Dr. Falana's Office after i met him at his chambers to beg him to accept the $900 as an advance payment. He told me that he will be traveling sometime next week so we have to be very quick about the CHANGE OF BENEFICIARY, I want you to send him the money as soon as possible so that we can get done with that and move ahead. Please, don't get yourself into any trouble. I await your response. I report the 6 emailaddresses in this story to abuse@... and ask for them to be closed. Thank you for caring. I dont know why FBI asks me all these questions. Strange thing have been happening since I was arrested in Sct. Petersburg some weeks ago. I dont know that I have done anything illegal, but maybe they think that my business with africans countries is suspicious. I would like to know when you will be able to send the advance payment to Barrister Gabriel so he can start preparing the CHANGE OF BENEFICIARY before he goes on christmas vaccation. Please, reply ASAP and have a nice weekend. After reviewing your message, we have determined that the eChina.com account mentioned in your message probably was involved in activities of abusing our email service. We have promptly suspended that account to stop those activities. Thank you again for reporting. This is Fred Martins, How are you doing? 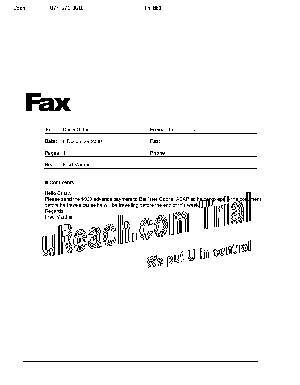 Tried caling you several times but kept on going to fax tone so i decided to send you a fax as a matter of urgency. Barrister Gabriel is expecting to haar from you cause he will be travelling before the end of this week. Please, we need to get done with the document before Barrister travels for christmas break so tha we can conclude this transaction before chrsitmas. REply via email. Regards, Fred Martins. Please send the $900 advance payment to Barrister Gabriel ASAP so he can prepare the document before he travels cause he will be travelling before the end of this week. How are u doing? hope ur fine, i have not hard from u? hope u do receive my mails,i need to hear from u on time. I also report the new account to abuse@echina.com. Thank you for reporting again on the abuse. You were right. The person indeed had another account on our server. We have promptly suspended that account. What is going on? I have not heard from you in awhile, is everything alright with you? Have you gotten intouch with Barrister Gabriel?Respond ASAP. I report the account fred_martins22000@yahoo.co.uk to abuse@yahoo.co.uk again, and ask the lawyer to be patient. I am sorry for not answering your email until now, but I have been very busy. At the moment I am in Toronto in urgent business. I will return to you regarding the "Fred Martins" case as soon as I return from Toronto. When will you return from your Christmas break? I would like to know if you are still interested in assisting me. I test the lawyer. Will he assist me in another case, or is he just interested in his own scam? I am back from Toronto. When will you leave for your Cristmas break? I need your help in collecting some money of mine, that reside in a Nigerian Bank.The problem is that I want it done as soon as possible, preferably in the beginning of next week. Will you assist me in that? I WILL RESUME SEAT ON THE 4TH OF JANUARY. I send them all my Seasons Greetings Card to see which emailaccounts are still open. THIS IS TO INFORM YOU THAT I AM BACK ON SEAT. I WOULD LIKE TO KNOW IF MY SERVICES IS STILL REQUIRED BY YOU BECAUSE I HAVE SO MANY CASES TO HANDLE SO YOU MUST ACT PRONPTLY ON YOUR ISSUE. Complement of the season, i hope you had a wonderful time? 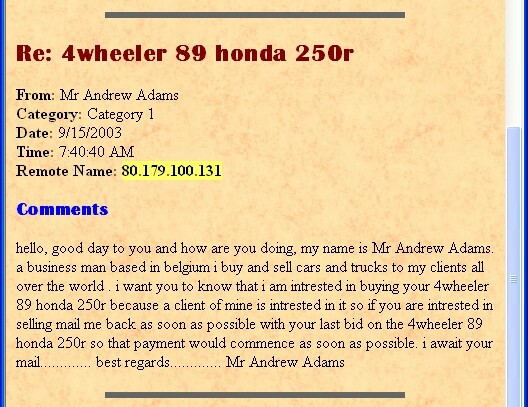 I want to know if you are still interested in assisting me in this transaction or if i should seek for a new partner? I await your soonest response. Thanks for writing to Yahoo! UKIE Customer Care. I did not hear from him again. I am Elvis Farms the only son of late Paul Farms the managing Director of DUBE petroleum company in Cotonu capital city of Benin I must confess my agitation is real, and my words is my bond, in this proposal. My late father was a petroleum marchant and because of his sucess in this field also because his wealth, his business associate in the field was very envy and family friend also was against him. After death of my mother when she was giving birth in 1985, when i was two years old(2yrs) because these my father has a great love for me.as his only son my confides a lot in me because he know that a day will come when i have manage his vast wealth but the relationship painfuly did not last. This is a story that seems like a fiction to me but today i am facing the reality of being an orphan who is also being hunted by men of wicked principles hence tragidy does not alter fact but fact remains when other hopes has being shatterd. amount, now all my hope is banked on you and I really wants to invest this money in your country, were there is stability of Government, political andeconomic welfare. Honestly I want you to believe that this transaction is real and never a joke. My late father Chief FARMS gave me the photocopies of the certificate of deposit issued to him by the (BANK) on the date of deposit,for you to be clarify because, I do not expose my self to anybody I see, I believe that you are able to keep this transaction secret for me because this money is the hope of my life, it is important. Please reply me immediately after you must have gone through my message fill free and make it urgent. That is the reason why I offered you 15 % of the total money amount, and in case of any other necessary expenses you might incur during this transaction. N.B Try and negotiate for me some profitable blue chip investment opportunities which is risky free which I can invest with this money when it is transferred to your account, personally I am interested in estate management and hotel business, please advise me. Reply me back immediately you receive this message formore explanation. And promisse me to be a father considering my situationan and not to betray me and also accept me to belong to your family once again i want to have a family. beneficiary / next of kin on the day of deposit and also told me to look for a foreign assistant or a foreigner with a legitimate bank Account abroad who will stand as co-beneficiary and partner abroad.